Illustrations: 6 b/w photographs, 2 maps. In early 1920 in Hawaii, Japanese sugar cane workers, faced with spiraling living expenses, defiantly struck for a wage increase to $1.25 per day. 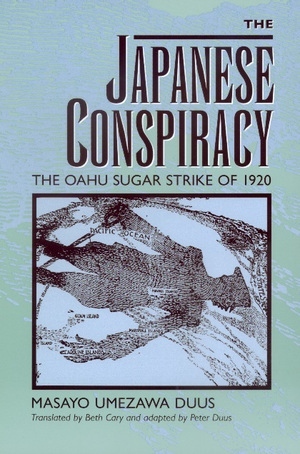 The event shook the traditional power structure in Hawaii and, as Masayo Duus demonstrates in this book, had consequences reaching all the way up to the eve of World War II. By the end of World War I, the Hawaiian Islands had become what a Japanese guidebook called a "Japanese village in the Pacific," with Japanese immigrant workers making up nearly half the work force on the Hawaiian sugar plantations. Although the strikers eventually capitulated, the Hawaiian territorial government, working closely with the planters, cracked down on the strike leaders, bringing them to trial for an alleged conspiracy to dynamite the house of a plantation official. And to end dependence on Japanese immigrant labor, the planters lobbied hard in Washington to lift restrictions on the immigration of Chinese workers. Placing the event in the context of immigration history as well as diplomatic history, Duus argues that the clash between the immigrant Japanese workers and the Hawaiian oligarchs deepened the mutual suspicion between the Japanese and United States governments. Eventually, she demonstrates, this suspicion led to the passage of the so-called Japanese Exclusion Act of 1924, an event that cast a long shadow into the future. Drawing on both Japanese- and English-language materials, including important unpublished trial documents, this richly detailed narrative focuses on the key actors in the strike. Its dramatic conclusions will have broad implications for further research in Asian American studies, labor history, and immigration history. Masayo Umezawa Duus is a nonfiction writer widely published in Japan. The Japanese edition of The Japanese Conspiracy won the Oya Soichi Prize and the Sincho Gakugei Prize, the two most distinguished nonfiction prizes in Japan. Her works in English include Tokyo Rose: Orphan of the Pacific (1979) and Unlikely Liberators: Men of the 100th and the 442nd (1987).